Authors: Jack J. Lissauer, Daniel C. Fabrycky, Eric B. Ford, et al. The dawn of the Kepler Space Telescope data has unearthed a treasure trove of new and unusual celestial objects. Among these new discoveries is the planetary system Kepler-11. The system contains six transiting planets that are packed incredibly close around the Sun-like star, much like sardines are packed very closely in cans. The first five of these planets fall within the orbit of Mercury, and the sixth one falls well within the orbit of Venus. Few systems like this have been discovered; most planetary systems have a much larger separation between the planets, yet this system has its planets arranged in an extremely packed, yet extraordinarily still stable, way. Figure 1: This figure from the NASA website is a visual representation of the Kepler-11 system, overlaid with the orbits of Mercury and Venus. When a single planet orbits a star, its period follows Kepler’s Laws to a tee; however, when other planets are introduced in the system, the orbiting bodies tend to perturb each other’s orbits. Their periods differ slightly according to the gravitational perturbations, and this variation is called a transit timing variation (TTV). Since Kepler-11 has five planets orbiting in extreme proximity to one another, it is the perfect illustration of measurements from transit-timing variations. The photometric Kepler data marked the discovery of this system. The transits for each of the planets appeared separately in the light curve of the system. The light curve is just a measurement of the brightness of the star over time, so when a planet passes in front of the star, the brightness decreases, causing the dip in the light curve. The shape varies with each planet based on differences in size of the planet and orbital radius. From this data, it is possible to measure the radius of the transiting planet. This team followed up their photometric data with spectroscopic analysis from the Keck I telescope. This additional data allowed for the precise measurements of transit-timing variations, which yielded mass measurements for the inner five planets. For the first five planets, the TTVs were successfully measured, and with this information, the research team found the densities of the inner five planets, which yielded a surprising result. These planets, despite being densely packed, are not made of very dense material. Kepler-11b is both closest to the Sun and densest, but only with an overall density of 3.31 g/cm3. For comparison, Earth has an overall density of about 5.5 g/cm3. 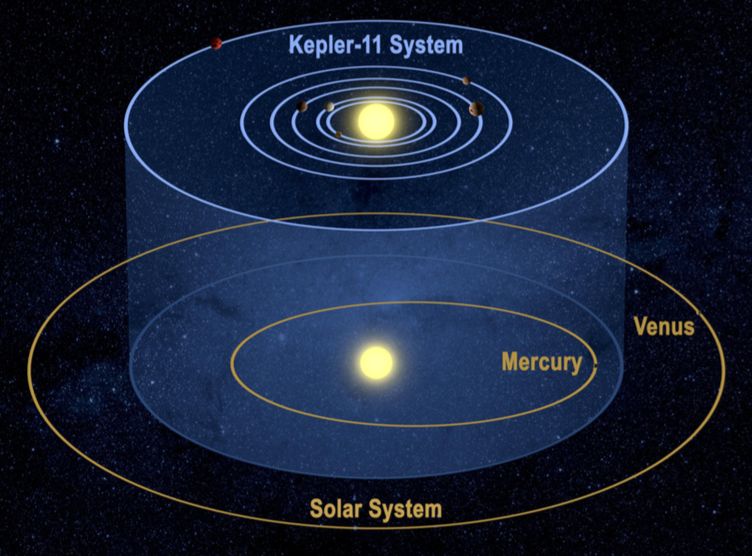 The densities of the planets orbiting Kepler-11 are depicted in Figure 2. 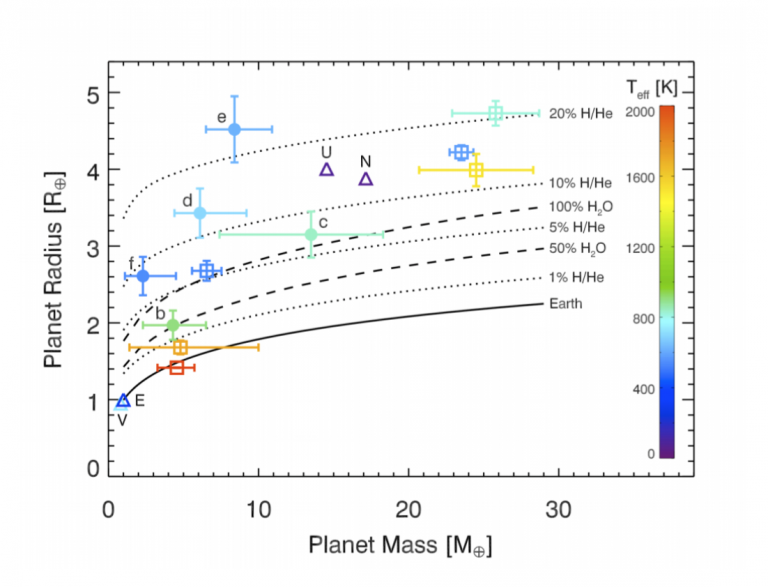 Figure 2: This shows the mass versus radius of the planets in the Kepler-11 system. The planets orbiting Kepler-11 are represented by the filled in circles. The other marking on the graph indicate planets in our solar system, shown for comparison. Figure 5 from today’s paper. While transit timing variations worked like a charm for the inner five planets, the sixth planet (Kepler-11g) was too distant from the others for this method to work well, so to confirm this planet, another method was employed. This team used several simulations to rule out alternate scenarios, which include chance alignment of the Kepler-11 system with and eclipsing star or with another star-planet system. This analysis successfully confirmed Kepler-11g , but because no TTVs could be measured for this particular planet, its mass and radius remain unknown. Even though this system has been more closely studied than most, the measurements have raised nearly as many questions as they have answered. The inner five have small inclinations and eccentricities, which implies some planetary migration process. However, since the periods of these planets are not in resonance, slow and convergent migration theories—which would naturally force the planets into resonant orbits—seem unlikely to be at play in this system. Formation of such a system is still a bit of a mystery. After all, such low-density planets are unusual and do not completely fit within the current understanding of planet formation. Kepler-11 continues to be one of the more intriguing planetary systems discovered, and its formation is not fully understood. Even though this system has been more closely studied than most, the measurements have raised nearly as many questions as they have answered. Systems like this extend our understanding of astrophysics, perhaps in a bit of an unexpected way; these closely packed planets have so much more to teach us about their system formation.